The following time-lapsed representation of the explosive growth in numbers and range of lionish sightings is unbelievable. 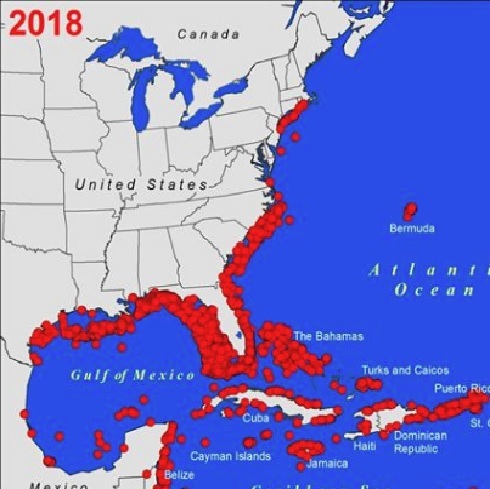 This map shows the spread of lionfish populations from 1985 to 2018. It clearly highlights the magnitude of what is going on. The map, produced by the USGS Wetlands and Aquatic Research Center, documents the explosive growth in lionfish populations throughout the Caribbean, Gulf of mexico and the US Atlantic Coast. With no natural predators to stem the growth and spread of lionfish, their populations have been exploding without resistance. Lionfish are voracious eaters. One lionfish can consume 20 fish in only a half hour. Furthermore, one female can spawn 27,000 to 100,000 eggs every 2.5 days which get carried by currents throughout the seas. It is easy to see how they can have a devastating effect on the marine food chain. All existing, or should I say conventional efforts to control the lionfish population have been unsuccessful. However, there is a shimmer of promise in creating a demand for the consumption of lionfish. They actually tasted great and since we (humans) are known to over-fish and over-consume, perhaps it could work in this case to control the lionfish populations. As of now, it looks like that is our only hope. Put a huge bounty on them. Very big. Consider the cost of their continued increase. Tourism, restaurants, fishing, diving, these big industries and others will suffer. In there natural environment what keeps their numbers in check? In Mexico the government funds Lion Fish hunts three twice a year. Divers are hired and paid a daily fee plus they are paid for all the Lion Fish they bring up, per kilo. It is a massive operation which helps cull the Lion Fish along the coast line and down the Playacar reef system. Le poisson lion est tout simplement délicieux cuit ou en ceviche. Laissez les plongeurs faire la chasse sous-marine à ce poisson. À Roatan au Honduras, ils ont choisi de joindre l’utile à l’agréable. Il existe un projet de formation de chasse sous-marine au poisson lion dans le parc marin (zone protégée) et en trois ans, le nombre a beaucoup diminué. They have learned to go and stay deep until nightfall. Divers alone cannot solve this crisis. I’ve killed near a thousand of these delicious buggers. But spearing them at night at 150 on a wall in Bull shark waters Is not a good idea to get into the habit of.